Treacle is a Rex rabbit, so she’s an average sized rabbit, not a giant. In a small hutch her body fills the whole living area. She certainly can’t stretch and run freely, and there are no toys, food bowl, hay rack in here. In reality, all she can do is sit. Rabbits need to run, jump, stretch up, dig and forage – it’s cruel to keep a rabbit alone and in a hutch. Because her hutch is so small she is exposed to all of the weather conditions, be that wind, rain or hot sun. Because of the wire on two sides, she has very little shelter. 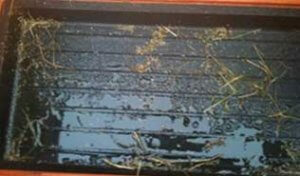 Rabbits can’t escape the weather in a hutch like this – it’s badly designed. After one night of rain, the hutch is wet (pictured), the bedding too. This means the rabbit is forced to stay in the tiny bedroom area, where they usually go to the toilet, or sit in the damp bedding. 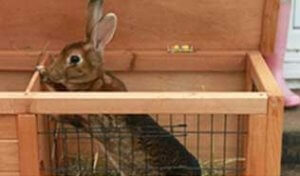 Rabbits should always be kept with the company of their own kind so a hutch must accommodate 2 rabbits comfortably. It should also allow them to make at least 3 hops and lie stretched out. In practice this means a minimum of 6ft x 2ft. The floor space needs to be at least 2 feet from front to back. In a two-tier style hutch, floor space is lost to the ramp so that must be taken into account. Rabbits must be able to stand up on their back legs without their ears touching the top so the hutch must be at least 2ft tall. Here is an example of a much better set-up. A 6ft hutch is placed inside a much larger secure enclosure filled with toys and tunnels. 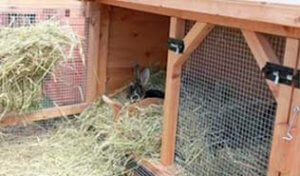 This allows the rabbits to display more of their natural behaviours. The small hutch from before is placed next to the enclosure to show the difference. It’s a world away isn’t it? On the right is an even better environment. The same 6ft hutch and 8ft run but connected via a tunnel system. 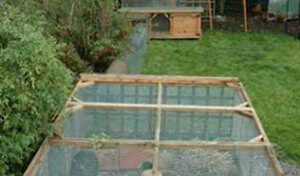 See how the rabbits have two completely separate areas joined by the tunnel? It’s in a rabbit’s nature to explore and this system is ideal. 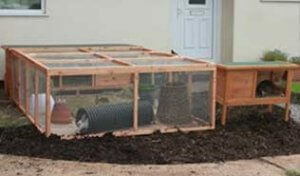 The RWAF and PDSA think the minimum set up for rabbits is a 6 x 2 x 2 ft hutch and an 8ft run. The run must have room for toys, digging places and tunnels. Rabbits can run and display normal behaviours in here. It is accepted that a hutch should allow a rabbit to do at least 3 hops (not steps) This is a requirement laid out in the Welsh Assembly Government’s Code of Practice for pet rabbit owners issued under the Animal Welfare Act 2006. This guideline is commonly under-estimated. Three hops is a lot further than people think. At rest Treacle (front) takes up 1 ft, one hop would take her to at least 2 ft, 2 hops to 3ft and 3 hops to 4ft so 4ft is the minimum to allow 3 hops. Look at Dexter behind, it takes him 6ft to take 3 unrestricted hops. Quite simply keeping a rabbit alone in a hutch without the opportunity to exercise, display normal behaviour or without companionship is not acceptable. It does not meet any of the animals fundamental requirements, or any of the owners responsibilities under the Animal Welfare Act 2006. 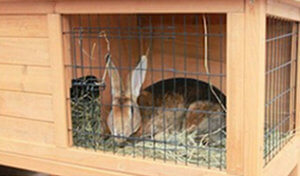 A hutch needs to be as large as possible and permanent attached to a secure exercise enclosure. A hutch 1.2m long, and 0.45m (which is a fairly common size found in pet shops of 4ft x 1.5ft) wide gives a floor area of 0.54m2. Did you know that this size is the Home Office minimum requirement for laboratory rabbits? With that in mind we don’t think that it’s too much to ask that retailers and owners don’t sell or buy anything of this size or smaller for their pet rabbits, who may live 10 years in them! Please note that we are recommending a minimum area size of 10ft x 6ft x 3ft high, however please always think bigger is better and there are other ways of housing your bunnies. Follow RWAF’s board A Hutch is NOT Enough! on Pinterest.